Sheila Craig was unfortunate enough to lose in four county finals at Ketton. Parkway’s Sarah Newson will be bidding for four national titles at next month’s English Women’s Bowling Federation Championships at Skegness following a marathon stint on the Ketton green in last Sunday’s Northants Bowling Federation Finals. Having qualified for five finals, the 38 year-old former England international spent close on eight hours on the green, but was rewarded with wins in the two-bowl singles, pairs with her mother Val, and both triples with Helen Crow and Pat Reynolds. Sarah Newson (left) beat Sue Moir in a thrilling Northanats County singles final. The one that got away was the four-bowl singles, but even then she held match lie before Sue Moir (Langtoft Pearl) came through on the rails to pip her 21-18. Spare a thought, though, for Sheila Craig (Conservative) who was beaten in no fewer than four finals and in all of them Newson was in the opposing corner. Liz Hext was involved in three of those defeats – pairs and both triples (Pat Bussey being the other player in the triples). Teenager Stephen Harris (Blackstones) retained his under 25 singles title, 21-13, in a repeat of last year’s final against Jack Corney (Peterborough & District). 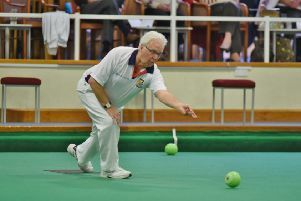 But 79-year-old Joe Martin (Peterborough & District) proved far too wily and experienced a customer for the youngster in the four-bowl singles, winning 21-16. Harris was also beaten in the under 25 pairs final, where Corney gained revenge for his earlier defeat as he partnered James Harford (Parkway) to a 19-17 win. Harford later completed a title double when he joined Stuart Reynolds and Joe Randall to defeat Yaxley’s Peter Marchant, Tony Belson and Chris Wheeler 25-5 in the two-bowl triples. That denied Belson a double having earlier skipped Robert Heath to the pairs title at the expense of Jeff Clipston and Mick Greaves (Peterborough & District) – 15-13. Adam Warrington (Blackstones), a former national champion, also achieved a double, defeating Graham Agger (Yaxley) 21-11 in the Champion of Champions singles, and then joining Martyn Dolby and Jonathan Earl to win the three-bowl triples, 21-10, against City of Peterborough’s ace trio Graham Jackson, Michael Humphries and Roger Martin. County men’s president Bob Warters had the emotional honour of winning the veterans singles trophy donated by his late parents following a 21-13 win over club-mate and host club president Peter Edwards. Ann and Malcolm Cullingworth (Langtoft Pearl) reached both mixed pairs finals. They lost the first to Parkway’s Chris Morton and Simon Law, but then won the senior one against Jane Needham and Martyn Dolby (Blackstones). Morton and Law failed to make it a double in the mixed triples with Howard Shipp as they went down to Shirley Suffling (Ketton) and Blackstones pair Nick Wilkie and Paul Buckley. Whittlesey Manor pair Roger Stevens and Tony Mace went one better than last year when they won the senior men’s pairs against Noel Catterwell and Martin Fletcher (Langtoft Pearl). 4b SINGLES: Joe Martin (Peterborough & District) bt Stephen Harris (Blackstones) 21-16. 2b SINGLES: Gavin Jinks (Whittlesey Manor) bt Lee Welsford (Whittlesey Manor) 21-18. U25 SINGLES: Stephen Harris (Blackstones) bt Jack Corney (Peterborough & District) 21-13. VETERANS SINGLES: Bob Warters (Ketton) bt Peter Edwards (Ketton) 21-13. CHAMPION OF CHAMPIONS: Adam Warrington (Blackstones) bt Graham Agger (Yaxley) 21-11. SECRETARY SINGLES: Melvyn Beck (Whittlesey Manor) bt Andrew Grief (Crowland) 21-15. PAIRS: Robert Heath & Tony Belson (Yaxley) bt Jeff Clipston & Mick Greaves (Peterborough & District) 15-13. SENIOR PAIRS: Roger Stevens & Tony Mace (Whittlesey Manor) bt Noel Catterwell & Martin Fletcher (Langtoft Pearl) 18-14. 2b TRIPLES: Stuart Reynolds, Joe Randall, James Harford (Parkway) bt Peter Marchant, Tony Belson, Chris Wheeler (Yaxley) 25-5. 3b TRIPLES: Adam Warrington, Martyn Dolby, Jonathan Earl (Blackstones) bt Graham Jackson, Michael Humphries, Roger Martin (City of Peterborough) 21-10. OPEN U25 PAIRS: Jack Corney (Peterborough & District) & James Harford (Parkway) bt Darren Middleton & Stephen Harris (Blackstones) 19-17. 4b SINGLES: Sue Moir (Langtoft Pearl) bt Sarah Newson (Parkway) 21-18. 2b SINGLES: Sarah Newson (Parkway) bt Sheila Craig (Conservative) 21-10. SENIOR SINGLES: Joan Robinson (Yaxley) bt Fiona Richardson (City of Peterborough) 21-14. CHAMPION OF CHAMPIONS: Ann White (Langtoft Pearl) – walkover. SECRETARY SINGLES: Liz Ritchie (Empingham) – walkover. PAIRS: Sarah & Val Newson (Parkway) bt Liz Hext & Sheila Craig (Conservative) 20-13. SENIOR PAIRS: Vivien Hempsall & Kathy Browning (Yaxley) bt Dee Brinkman & Joan Robinson (Yaxley) 16-14. 2b TRIPLES: Helen Crow, Sarah Newson, Pat Reynolds (Parkway) bt Liz Hext, Pat Bussey, Sheila Craig (Conservative) 28-10. 3b TRIPLES: Helen Crow, Sarah Newson, Pat Reynolds (Parkway) bt Liz Hext, Pat Bussey, Sheila Craig (Conservative) 17-16. PAIRS: Chris Morton & Simon Law (Parkway) bt Ann & Malcolm Cullingworth (Langtoft Pearl) 18-16. SENIOR PAIRS: Ann & Malcolm Cullingworth (Langtoft Pearl) bt Jane Needham & Martyn Dolby (Blackstones) 24-9. TRIPLES: Shirley Suffling (Ketton), Nick Wilkie, Paul Buckley (Blackstones) bt Howard Shipp, Chris Morton, Simon Law (Parkway) 22-18. Note: Linda Darani (City of Peterborough) was unfortunately indisposed and had to concede the finals of the secretaries singles and the Champion of Champions singles. East Community A bt Whittlesey Town 55-40; Whittlesey Manor B bt Yaxley Kites 61-57; Yaxley Eagles bt Whittlesey Manor A 56-47; West Ward A bt Langtoft Pearl A 75-55.